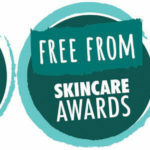 The only awards dedicated to ‘free from’ cosmetics and skincare products, now in their eighth year. 2018 winner Kate Porter of Harborist (centre), with other winners and organisers. 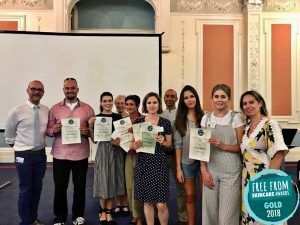 Entry to the 2019 Free From Skincare Awards is now open and closes on 26th April 2019. Testing and judging will take place April–June. The results will be announced at the end of June or early July. To learn more, including how to enter the Awards, start here. The Winner of the 2018 Award for Best Free From Skincare product was Harborist’s Balm-Gel Cleanser. For the full list of 2018 Winners, including brand winners, category Gold winners, and Silver and Bronze medallists, click here. To read press coverage on the Awards, click here. Eliza Riddell, All Natural Soap Co. The FreeFrom Skin Care Awards are designed to celebrate and encourage skincare and cosmetics manufacturers who create products that exclude some of the allergens, fragrances and other ingredients sometimes associated with skin and health issues, ethical and environmental concerns, and which may appeal to those looking for purer or more natural cosmetics and products for their skin, including those with problem skin conditions. To learn more about our rigorous judging process, click here. Please contact either Kirsty or Alex.